Every firm you talk to will tell you how “agile” they are, or that they run their projects exclusively with PMP certified project managers. That’s all well and good, but these are orthodox requirements for consulting – clients expect a professional & methodical approach to managing timelines, deliverables, risk, and budgets for every engagement. At Syntelli, we are so devoted to continued customer success that we have invested the time, money, and effort in elevating the engagement process above the norm, creating a continuous deployment loop for our clientele. 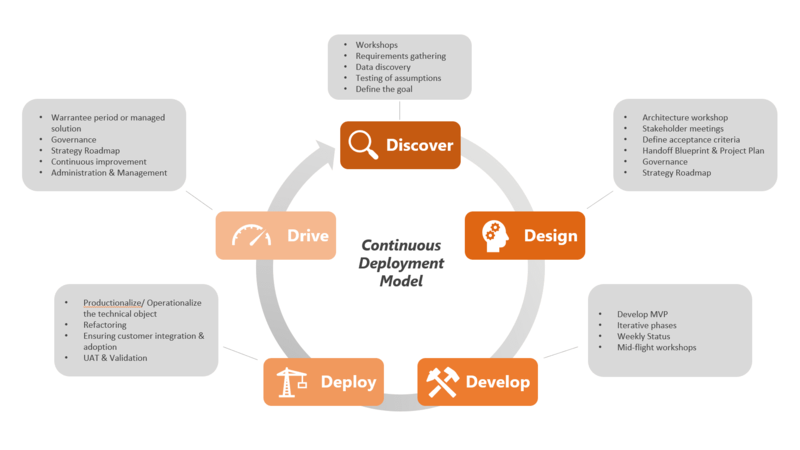 Our proprietary “5-D” methodology blends design thinking principles with agile best practices to maximize velocity and convert insights to impact faster than any of our peers. So how does this work? Is it all just smoke, mirrors, and fancy buzzwords? In order to drive the most value for the firm, we frontload resources to Discover, Design, and Develop solutions that solve your problems and deliver superior value. Discover is all about framing the problem; what are we trying to accomplish, and what constraints do we have to abide by? Next, it is absolutely critical that your strategic business initiatives tie to your data/analytics initiatives, so we take the time to conduct interviews and thorough analyses during the Design phase. This culminates with Development, where we tie it all together and begin to transition into implementation. In implementation, we focus on Deploying and Driving quick wins for the organization, allowing you to realize returns and move the needle. Deployment revolves around our engineering and science teams enabling, enhancing, and improving your firm’s capabilities. Here, whenever possible, we look to prioritize “triple-word scores” – initiatives that noticeably drive positive impact across multiple lines of your business or deliver value to multiple business objectives. Once we have Deployed these solutions, realizing the value in production, we shift into Drive. Here Syntelli offers continuous improvement either through a warrantee period or a full MAaaS engagement. 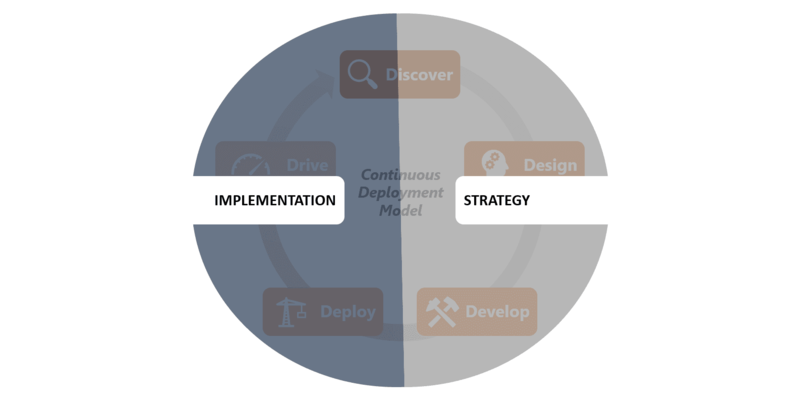 By continually cycling through this framework, we also keep a constant finger on the pulse of your strategy. For decades, “strategy” has been a favorite activity of executives, where countless hours and dollars are spent developing intricate statements, maps, and initiatives, only to be ordered and then forgotten about. 2) we can identify shifts in the market and help you course-correct ahead of your competition. “Discover” bridges the gap between implementation and formulation, as the most successful organizations are always looking for the next impactful use case. Contact our experts today to locate triple-word scores in your organization.